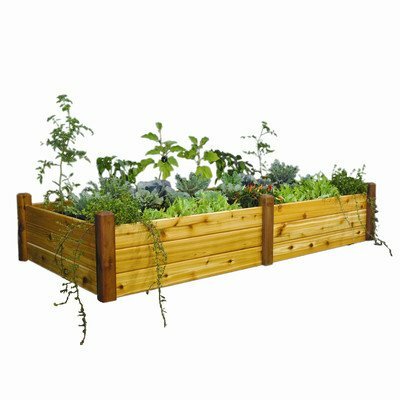 Rectangular Raised Garden Size: 19'' H x 95'' W x 48'' D by Gronomics at Tulips Orchids. MPN: RGBT 48-95S. Hurry! Limited time offer. Offer valid only while supplies last. RGBT 48-95S Size: 19'' H x 95'' W x 48'' D Features: -Handcrafted. -Made in USA. -Constructed from 100% western red cedar. -Food contact safe finish. RGBT 48-95S Size: 19" H x 95" W x 48" D Features: -Handcrafted. -Made in USA. -Constructed from 100% western red cedar. -Food contact safe finish. -Open bottom: Yes. Material: -Wood. Color: -Brown. Shape: -Rectangular. Water Resistant: -Yes. Warp Resistant: -Yes. Rot Resistant: -Yes. Country of Manufacture: -United States. Material Details: -Western red cedar. Dimensions: Size 19" H x 34" W x 34" D - Overall Height - Top to Bottom: -19". Size 19" H x 34" W x 34" D - Overall Width - Side to Side: -34". Size 19" H x 34" W x 34" D - Overall Depth - Front to Back: -34". Size 19" H x 95" W x 34" D - Overall Height - Top to Bottom: -19". Size 19" H x 95" W x 34" D - Overall Width - Side to Side: -95". Size 19" H x 95" W x 34" D - Overall Depth - Front to Back: -34". Size 19" H x 48" W x 48" D - Overall Height - Top to Bottom: -19". Size 19" H x 48" W x 48" D - Overall Width - Side to Side: -48". Size 19" H x 48" W x 48" D - Overall Depth - Front to Back: -48". Size 19" H x 95" W x 48" D - Overall Height - Top to Bottom: -19". Size 19" H x 95" W x 48" D - Overall Width - Side to Side: -95". Size 19" H x 95" W x 48" D - Overall Depth - Front to Back: -48". Warranty: Product Warranty: -1 Year.